How do ethnic investors select their advisor? Financial advisors often need to tailor their advice based on the investor’s age, gender, wealth level, occupation and advisor dependency. They also need to consider the investors’ ethnic background. Spectrem’s new study in its Ethnic Segmentation Series – “Advisor Relationships and Changing Advice Requirements” – examines the different ways ethnic investors relate to the advisor with whom they work. The study looks at investors of affluent African-American, Hispanic and Asian backgrounds. More than an investment track record, the company with which the financial advisor is affiliated, or even fees or commissions charged, honesty, trustworthiness and transparency are the most important factors in choosing a financial advisor. More than nine-in-ten affluent investors rank these the primary criteria they consider most in their advisor search. 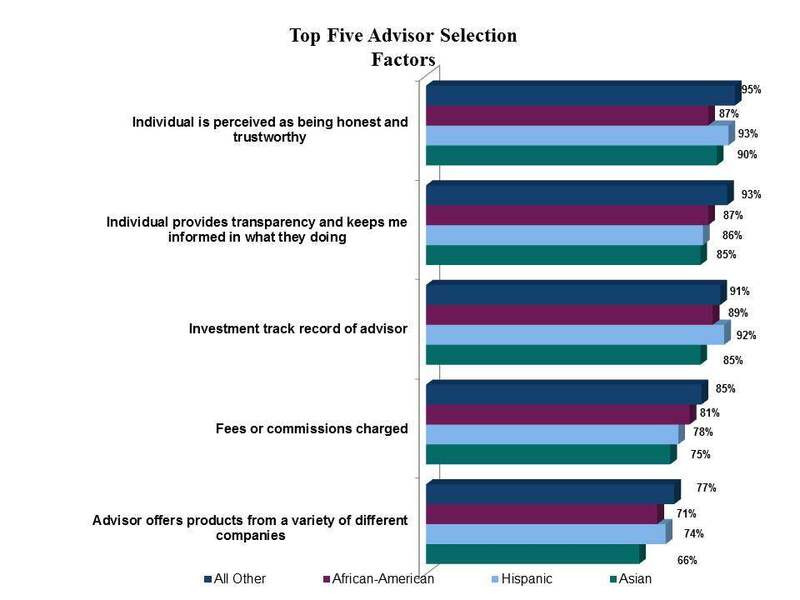 Investors from different ethnic backgrounds place a higher priority on some advisor selection factors than others. For example, eight-in-ten affluent Black investors consider whether or not a financial advisor is associated with a well-known brand or company, compared with 74 percent of affluent Hispanics and 63 percent of affluent Asians. Affluent Hispanics surveyed place a higher premium than their Black or Asian counterparts on an advisor’s investment track record (92 percent vs. 89 percent and 85 percent, respectively). It is also more important to these Hispanic investors that their financial advisor comes with a strong referral or recommendation from a trusted associate (79 percent vs. 70 percent of Blacks and 66 percent of Asians). Other factors affluent Hispanics are most likely to consider when choosing a financial advisor is that he or she “offer non-traditional opportunities and wealth management capabilities to meet needs” (65 percent vs. 56 percent of Asians and 54 percent of Blacks) as well as that the advisor offers products from a variety of different companies (74 percent vs. 71 percent of Blacks and 66 percent of Asians). Asians are just slightly more likely to go with a financial advisor based on the website and online services offered (65 percent vs. 64 percent of blacks and 61 percent of Hispanics).